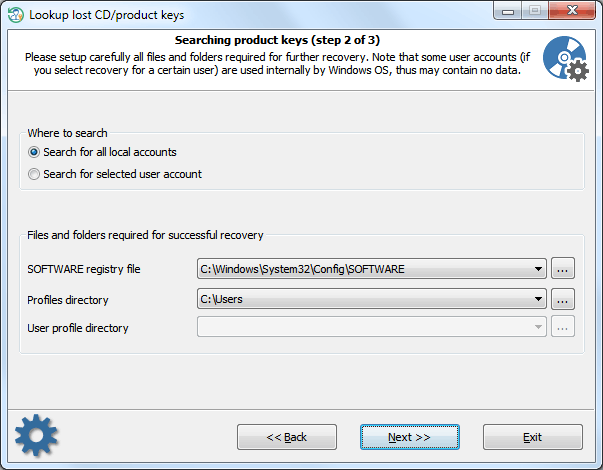 Using this feature, you can easily recover lost product keys and serial numbers, even if the target system is not bootable any longer. Almost all commercial programs for Windows come with a serial key that binds the program to your PC and makes the software legal or fully featured. By losing this key, you will no longer have access to your own software unless you get the key back. Just imagine that one day you need to reinstall your operating system. There might be a lot of reasons why you want to do so, from updating to getting rid of viruses, fixing a problem, etc. And after reinstalling, you will find out that you need to reinstall most of your software and supply it with serial codes that you no longer have access to. Without the keys, you cannot reinstall the software. Luckily, a large proportion of computer programs store their product keys in the Windows registry and thus can easily be extracted. That's what this feature is for. Using a built-in script language, the program can recover serial keys for more than 1,000 software products. And yet it is very simple to use. SOFTWARE registry file that is located at the following directory: 'C:/Windows/System32/Config'. Note, the drive letter, as well as the Windows folder, may be different. For example, 'D:/Windows', 'E:/Win', etc. Profiles folder. That is the directory where all local user accounts are physically stored. For Windows Vista and higher OSs, it is usually 'C:\Users' while Windows XP uses the 'C:\Documents and Settings' folder. Usually, the profiles folder is on the same drive where the Windows directory is located, not always though. The program will attempt to detect these folders automatically. All you need to do is select one from the drop-down list or show an alternative path otherwise. If you need to recover serials for a certain user, just set the appropriate option and additionally select the user from the 'User profile directory' list. 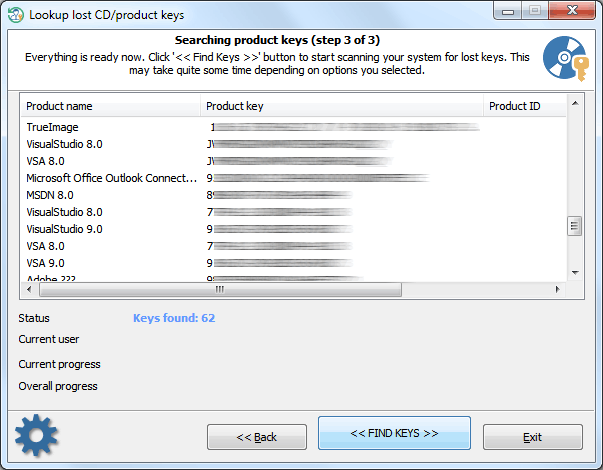 After the required options are set, proceed to the final step and clicking the '<< FIND KEYS >>' button to start the program searching for lost serial keys. Right-click on the list of found items to save the data to text or HTML file.